KG Graduation Day was celebrated on 22 March 2019. Prizes were given to best outgoing KG children, children with 100% attendance and Thirukural competition winners. The Bulletin board competition was held everymonth for Students of all the classes from 1- 12. They were instructed to display their work on the assigned bulletin boards. The bulletin boards were numbered and assigned to all the classes. 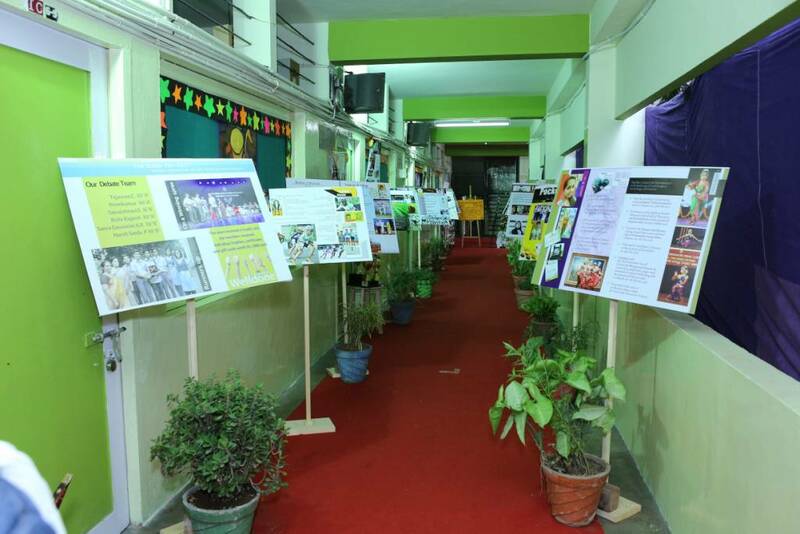 The students were to put up their displays once in every month as per the given theme. The purpose of the bulletin board competition is to recognise creativity in designing the bulletin board that reflects the educational theme. Judges were invited every month and the monthly results were declared in the assembly. All the classes participated enthusiastically. R. Sanjay Krishna of our Vidyalaya had visited a village called Keezhathottam near Adhiramapattinam after it was devastated by cyclone ‘Gaja’ which struck the Coromandel Coast of Tamil Nadu on 16th November 2018. He was appalled at the state of the village as people had lost their homes and livelihood. This made him to do his part in helping to rehabilitate and restore normalcy in the village. He started mobilising funds by talking to his friends at school and near his home. He also utilised the Social Media for collecting funds for this cause. 14 students along with Sanjay Krishna of our Vidyalaya contributed Rs.1.23 Lakhs towards the rehabilitation process. They decided to utilise this fund for constructing a rural shelter and 10 houses too. The students were personally involved in every stage of the construction. They worked tirelessly along with the villagers to accomplish the task they had undertaken. Their efforts are commendable. They were extremely happy to contribute and work for a worthy cause. E.J.Gautham Ajay Raj of class IX and S.Chandana from our Vidyalaya participated in the Republic Day Parade on 26 Jan 2019, held at Marina, Chennai. Chandana participated in the contingent TAMILNADU POLICE TRAFFIC WARDENS ORGANISATION - ROAD SAFETY PATROL and Gautham Ajay Raj also participated in the ROAD SAFETY PATROL contingent. This is the second consecutive year of participation in the parade for E J Gautham Ajay Raj. It is not enough to be just a patriot. We have to be an environmentalist patriot. We, the Chinmaya family members celebrated Republic Day with great patriotic fervour with eco friendly seed flag, adorning our proud chest. 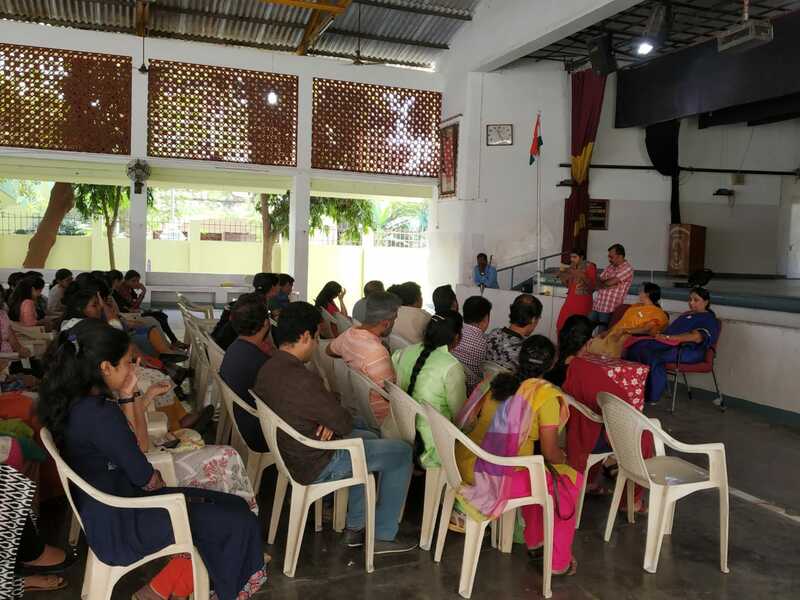 Gita Chanting Finals for Category A2 (Classes I and II) were conducted on our school premises on 6 Jan 2019. All the children selected for finals from their respective schools participated enthusiastically and gave their best performance. Children chanted Hanuman Chalisa at Adimoola Perumal Temple in Vadapalani, on 5th Jan 2019 on the eve of Hanuman Jayanthi. It was a divine experience for the children and were applauded by the public for their performance. "One World One Dream" - Was the theme of the Kindergarten Cultural show on 21st Dec 2018 at our school auditorium. Smt.Sharmila Soman, Vice Principal, Kola Saraswathi Vaishnav Sr.Sec. School graced the occasion as Chief Guest. The performances of the tinytots left the audience mesmerized. As part of Karuna Club Activity, the Bal Sevaks of our vidyalaya held the Ahimsa Peace Rally on 10 Oct 2018. All the students of classes 7th and 8th enthusiastically participated in the Rally. Children distributed pamphlets on ahimsa and non-violence to people on the rally route. They also made and displayed placards on Ahimsa. Best Placards were awarded prizes. Students put a stall for CORD products during Area Yagna, in order to promote CORD products and to help the village people by selling their hand-made products. The total sale amount was Rs.10300/-. Chinmaya Vidyalayas Celebrated 50 years of Chinmaya Educational Movement on 19 Oct 2018, Vijayadasami, at Nehru Indoor Stadium, Chennai. Navaratri was celebrated by Kindergarten tinytots dressing up as Gods and Goddesses to present a Live Golu. The topic was the Hindu Trinity of Gods - Shiva, Vishnu, Brahma with Parvathi, Lakshmi and Saraswathy in their various forms and avatars. Navaratri was celebrated enthusiastically in the school with a beautiful Golu arrangment. The topic chosen was Divine Saints and dolls depicting the saints Pandaripuram, Gorakhumbar, Meerabai and Sakkubai were displayed in the golu. All the children and many parents visited the beautiful display. Matrudina is celebrated every year in the school joyously and this year it was celebrated on 10 Oct 2018. Many parents and children participated with enthusiasm and the children utilized the unique chance to show their love and respect for their parents. Book Fair 2018 was inaugurated in the school today (11 Oct 2018) by our chief guest, Ms.Aparna Bhattacharya, Senior Manager, Library Operations, British Council, Chennai. Ms.Bhattacharya, chief guest, gave an inspiring speech and gave away prizes to the winners in competitions conducted by library. Many publishers are participating in the event enthusiastically with a wide variety of books on display. The bookfair is open to all from 11 Oct 2018 till 13 Oct 2018 between 9 AM and 4.30 PM. On the happy Sunday of 9 th September 2018 Gurucool organised the coolest, biggest the most ‘Awesome Birthday Carnival’ for the favourite duo of every kid – the ever charming Krishna & the super wise Ganesha. With an unconventional twist to the celebration of Krishna Janmashtami & Ganesh Chaturthi, this carnival engaged children of 3-15 years of age through interesting value- based games with deep insights.More than 150 families participated in this fun-fair. The young volunteers from Gurucool created an atmosphere that was positive & electric at the same time. Everybody went home with hands full of Prasad & gifts, a mind full of good memories & a heart full of happiness. Krishna Jayanthi was celebrated in our Vidyalaya in a grand manner with many activities. Kindergarten children left the audience spellbound with bhajans and dance. Primary children performed dances and tableau on Krishna and his life. Parents of high school children performed Namasamkeerthanam. Middle school children decorated their classrooms, performed pooja and distributed Prasadam. Parents also enthusiastically participated in Rangoli and Uriyadi (Breaking of Pot) competitions. As part of Seva, 7th and 8th Standard students from our Vidyalaya organised a food mela with delicious food which was sold to the students at a subsidized price. The proceeds of the event would be donated to childrens orphanage. Children while working for humanitarian cause also got to try their cooking, sales and marketing skills. 72nd Independence Day was celebrated with patriotic fervour in our Vidyalaya. Dr.N.Krishnakumar, I.F.S., Chairman, State Environment Impact Assessment Authority, Tamil Nadu, hoisted the National Flag, presided over the function and distributed the prizes to the primary children for the Academic Year 2017-18. The flag song, the speeches in English and Tamil and the choral music were a treat to the ears. Holistic Development of the child and owning up responsibility even when working as a team were the focus points of the Presidential address. On 23rd July, 2018, Ms.Sharanya Manivannan author of a book - ‘THE AMMUCHI PUCHI’ visited our school and interacted with the students of class 3. Ms.Sharanya is an award winning writer. Her fiction, poetry and essays have been widely published. ‘The Ammuchi Puchi’ is her first picture book for children. The author started the session by introducing the characters in her book followed by a video clipping of the book narrating the story. After the story session , children were asked to narrate their own stories about their grand parents. Most of the children enthusiastically came forward to share their experiences. Finally, question-answer session was conducted where in children posted numerable questions to the author which made her feel happy. The author also appreciated the creativity and enthusiasm of the students. Altogether, it was truly a motivating and learning experience for the students. They are sure to ready more books. 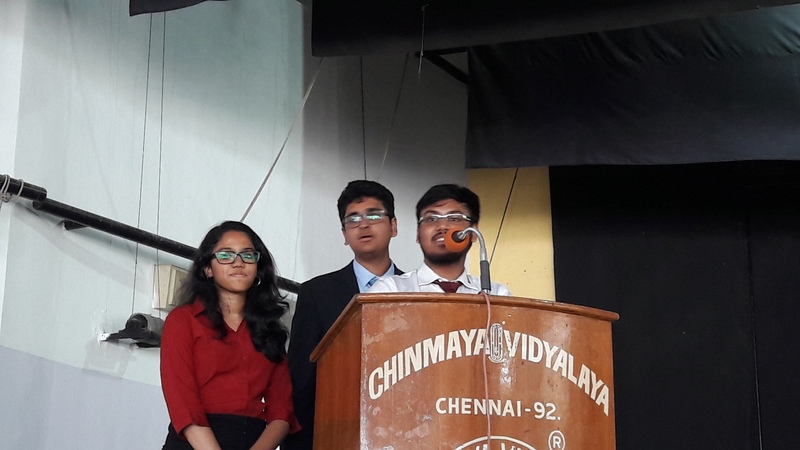 Karuna Club Inaugural function was conducted on 26th June 2018 at Chinmaya Vidyalaya Sr. Sec. School, Virugambakkam. Sri Sajjanraj Surana Presided over the function and inaugurated the Karuna Club activities for the year 2018 - 19 by lighting the traditional kuthuvilakku. Our Principal introduced the guest to the gathering and gave away the welcome address. Students of class 8 performed a dance programme to a song based on Karuna values of compassion towards animals and conservation of eco-system followed by a song. Students took the Karuna pledge and resolved to live the Karuna way of life. Mrs Vijayalakshmi Mohan of Social dept won the third prize in the national Chinmaya Quotient quiz organised by CCMTEC for teachers of Chinmaya VIdyalayas. 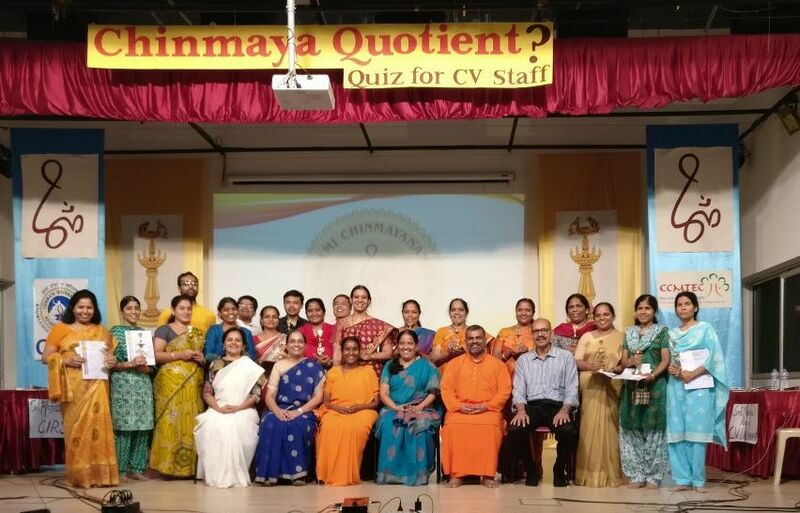 Around 3700 teachers of nationwide Chinmaya vidyalayas took part in the school level quiz programme in which Mrs.Vijayalakshmi Mohan was selected for the Zonal level competition and entered the finals. The final quiz was held on 21st April 2018 at CIRS, Coimbatore which had an elimination round in the morning session and Mrs.Vijayalakshmi Mohan successfully entered the final round of Oral Quiz with four other toppers and bagged the third place. She was awarded a cash prize of fifteen thousand rupees. Chinmaya Nagar, Stage II, Virugambakkam, Chennai – 600 092.